CCL15, a member of the CC chemokine family, is a potent chemoattractant for leukocytes and endothelial cells (ECs). 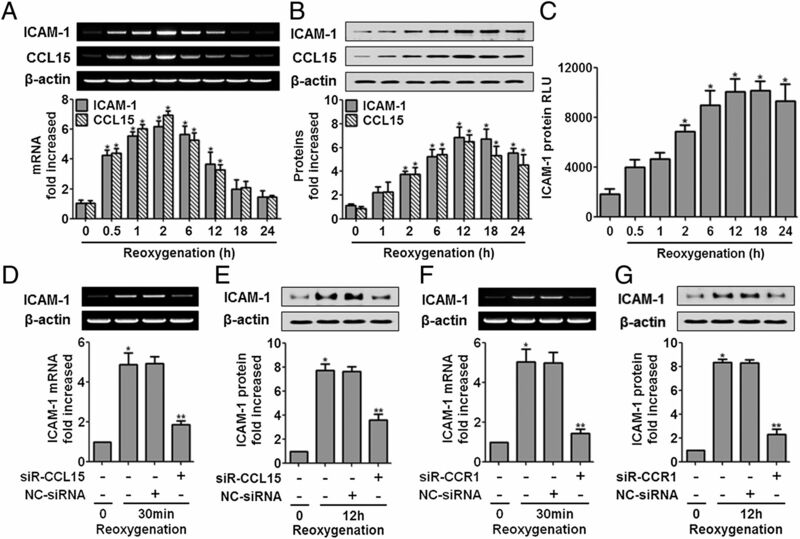 Given that chemokines play key roles in vascular inflammation, we investigated the effects of hypoxia/reoxygenation (H/R) on expression of human CCL15 and a role of CCL15 in upregulating ICAM-1 in ECs. We found that exposure of ECs to H/R increased expression of CCL15 and ICAM-1, which resulted in an increase in monocyte adhesivity to the ECs. Further studies revealed that knockdown of CCL15 or CCR1 attenuated expression of ICAM-1 in ECs after H/R, suggesting that expression of ICAM-1 is upregulated by CCL15. Stimulation of ECs with CCL15 significantly increased expression of ICAM-1 predominantly via the CCR1 receptor. We observed that phosphorylation of JAK2 and STAT3 was stimulated by CCL15 treatment of ECs. Results from reporter and chromatin immunoprecipitation assays revealed that CCL15 activates transcription from the IFN-γ activation site promoter and stimulates binding of STAT3 to the ICAM-1 promoter. Our data also showed that CCL15 increased cell adhesion of human monocytes to ECs under static and shear-stress conditions. Pretreatment of these cells with inhibitors for JAK, PI3K, and AKT prevented the CCL15-induced expression of ICAM-1 and monocyte adhesion to ECs, suggesting the involvement of those signaling molecules in ICAM-1 gene activation by CCL15. The results suggest that CCR1 and its ligands may be a potential target for treating inflammatory diseases involving upregulation of cell adhesion molecules. Hypoxia/reoxygenation (H/R) is known to stimulate endothelial cells (ECs) through oxidant production (1), which leads to induce the production of inflammatory cytokines and to activate inflammatory cellular signaling pathways (2–4). Major events in the inflammatory response are the migration of leukocytes from the blood, their adhesion to the vascular endothelium, and their transmigration across the endothelium. Many different types of adhesion molecules on the leukocytes and the endothelium play important roles in the cell adhesion process (5, 6). Among these adhesion molecules, ICAM-1 (CD54) is one of the most characterized adhesion molecules expressed on a limited number of cell types, but expression can be induced in various cell lineages by inflammatory mediators such as TNF-α, IL-6, and IFN-γ (7, 8). External stimuli such as inflammatory cytokines, chemokines, oxidative stresses, or LPS induce high levels of ICAM-1 expression in ECs. The signal pathways involved in the regulation of ICAM-1 expression by a number of proinflammatory cytokines and chemokines include PI3K, MAPKs, and the NF-κB pathways (9–11). Reactive oxygen species and cytokines such as IFN-γ and IL-6 are known to induce ICAM-1 expression via the IFN-γ activation site (GAS) (12–15). Chemokines secreted by ECs and extravascular cells play a major role in promoting leukocyte firm adhesion (16). There are a number of reports of enhanced expression of chemokines including CCL3, CCL5, CCL15, and CXCL1 in the inflammatory lesions of atherosclerosis (17–19). CCL15 (also referred to as leukotactin-1, MIP5, HCC-2, and NCC-3, or MIP-1δ) functions on a variety of cells, including monocytes, neutrophils, and ECs (20, 21). CCL15 is known to be an agonist of CCR1 and CCR3, which belong to the seven transmembrane domain G protein–coupled receptor (GPCR) family (22). It has been reported that ECs express CCR1 and CCR3, and that CCL15 stimulates chemotactic migration and differentiation of ECs (21). CCL15 also induces expression of proinflammatory cytokines and tissue factors in activated monocytes (17). Previous studies have demonstrated activation of JAK/STAT signaling pathways and delineated their roles in inflammatory processes, such as the elevated expression of adhesion molecules. JAKs are activated via direct association with cell surface receptors such as the IFN receptor (23). The major action of JAKs is to stimulate gene transcription by activating STAT factors. Once activated, STAT proteins dimerize and translocate to the nucleus, where they bind to the GAS. Homodimerized STAT3 and heterodimerized STAT1/STAT3 have been shown to have affinity for, and to bind to, the GAS (24). It is unknown whether CCL15 and other CCR1 chemokines are upregulated and play roles in the activation of ECs stimulated by H/R. Thus, we investigated the role of CCL15 in the upregulation of ICAM-1 expression and the signaling pathway involved in activation of ECs. We found that expression of CCL15 and ICAM-1 is upregulated by H/R, and that knockdown of CCR1 or CCL15 attenuated expression of ICAM-1 in ECs after H/R. We also showed that CCL15 induced ICAM-1 expression in HUVECs and monocyte adhesion to ECs predominantly via CCR1. Furthermore, our data demonstrate that CCL15 induces expression of ICAM-1 via activation of the JAK2/STAT3 signal pathway. PBMCs were purchased from Sanguine BioSciences (Valencia, CA). Cell culture medium 199 (M199), FBS, and antibiotics (penicillin/streptomycin) were purchased from Life Technologies BRL (Rockville, MD). Anti-human ICAM-1 and anti–β-actin Abs were from Santa Cruz Biotechnology (Santa Cruz, CA). Anti-CCR1, anti-CCR3, and anti-CCL15 Abs were purchased from R&D Systems (Minneapolis, MN). Abs for phospho-JAK2, phospho-PI3K, phospho-AKT, phospho-STAT3, anti-JAK2, anti-AKT, and anti-STAT3 were obtained from Cell Signaling Technology (Beverly, MA). Signal inhibitors AG490 (a JAK2 inhibitor) and LY294002 (a PI3K/AKT inhibitor) were obtained from Cell Signaling Technology and pyrrolidine dithiocarbamate (PDTC; an NF-κB inhibitor) was from Calbiochem (San Diego, CA). Primers for PCR analysis were purchased from Bioneer (Daejeon, Korea), and small interfering RNAs (siRNAs) were obtained from Bioneer or Santa Cruz Biotechnology. Other chemicals were obtained commercially from Sigma-Aldrich (St. Louis, MO). HUVECs (Bio-Medical Science, Seoul, Korea) were grown to three to six passages in M199 supplemented with 10% FBS, 100 U/ml penicillin, 100 μg/ml streptomycin, 3 ng/ml basic fibroblast growth factor, and 5 U/ml heparin at 37°C under a humidified 95/5% (v/v) mixture of air and CO2, respectively. Human monocyte-like cell line U937, THP-1, and PBMCs were grown in complete RPMI 1640 medium containing 10% FBS, 100 U/ml penicillin, and 100 μg/ml streptomycin at 37°C under a humidified 95/5% (v/v) mixture of air and CO2, respectively. Standard normoxic conditions comprised 21% O2 and 5% CO2 at 37°C. For hypoxic conditions, HUVECs were grown in a hypoxic workstation (Galaxy 48R; RS Biotech, Irvine, U.K.) flushed with a mixture of 94% N2, 5% CO2, and 1% O2, in which the hypoxic environment (O2 < 3%, 5% CO2) was kept constant at 37°C in a humidity of 90%. Mutations were introduced into the GAS elements within the ICAM-1/Luc plasmid using mutagenic primers and a site-directed mutagenesis kit (Transformer; Clontech, Mountain View, CA) following the procedure as supplied by the manufacturer. The mutagenic GAS (mGAS) primer with the sequence GCG CGA GGT TAG CGG TCA AGC AGC AC was used to make the underlined four base changes. A selection primer with the sequence AAA TCG ATA ATG ATC AGT CGA CCG AT was used to make the underlined two base changes that convert the unique BamHI site into the BglII site. The generated site-directed mutagenic changes were verified by sequencing from Macrogen (Seoul, Korea). To construct the ICAM-1 luciferase plasmids, we cloned regions spanning −1350 to +45 bp of the human ICAM-1 promoter into vector pGL3-basic (Promega, Madison, WI). HUVECs were transfected with 1 μg each of the plasmids, empty vector (pGL3-basic), pICAM-1/Luc, pICAM-1 (mGAS)/Luc, pNF-κB/Luc, or pGAS/Luc (Stratagene, La Jolla, CA) using Lipofectamine 2000 (Invitrogen, Carlsbad, CA). Cell extracts were prepared 24 h after transfection, and luciferase assays were performed using the Renilla luciferase assay kit. The luciferase assay was performed by a method using an enhanced Renilla luciferase assay kit (Promega) in each sample. HUVECs were transfected with 10–100 nM of a specific siRNA or with nonspecific control siRNA (NC-siRNA) using Lipofectamine 2000 (Invitrogen) according to the manufacturer’s protocol. The siRNAs used in this study are as follow: CCR1-siRNA (siR-CCR1), CCR3-siRNA (siR-CCR3), ICAM-1-siRNA (siR-ICAM-1), and CCL15-siRNA (siR-CCL15). After 4 h, the cultures were recovered with full media for 36 h. The transfected cells were then stimulated with CCL15 (50 ng/ml), CCL3 (50 ng/ml), CCL5 (50 ng/ml), IL-1β (5 ng/ml), TNF-α (5 ng/ml), or with IFN-γ (50 ng/ml) or H/R stimuli as indicated. Chromatin immunoprecipitation (ChIP) assay was performed to examine the association of STAT3 and/or NF-κB with ICAM-1 promoter according to the methods previously described (25). HUVECs were treated or not treated with CCL15 for 12 h and harvested in lysis buffer with protease inhibitor. Cells were fixed with 1% formaldehyde, sonicated, and precleared with protein A-Sepharose beads (Santa Cruz Biotechnology). Chromatin suspension was incubated with a specific Ab or normal rabbit IgG overnight at 4°C. An aliquot of the chromatin suspension (∼10%) was set aside as the input sample. The primers for amplification of ICAM-1 promoter region were also used: forward, 5′-CGA TTG CTT TAG CTT GGA AA-3′, reverse, 5′-TTT ATA GCG CTA GCC ACC TG-3′. Total RNA was isolated from HUVECs using a commercially available RNA-Bee isolation kit (Tel-Test, Friendswood, TX) as previously described (25). The following primers were used in PCR reactions: ICAM-1, forward, 5′-CGA CCT TGG TTG TGG CTG ACT-3′, reverse, 5′-CCC TTC TGG TTG GTG GCT TTG-3′; CCL15, forward, 5′-CAG GAG GAT GAA GGT CTC CG-3′, reverse, 5′-CAT GCA ATC CTG AAC TCC-3′; CCR1, forward, 5′-CTC TTC CTG TTC ACG CTT CC-3′, reverse, 5′-GCC TGA AAC AGC TTC CAC TC-3′; CCR3, forward, 5′-CCA TGG CAT GTG TAA GCT CC-3′, reverse, 5′-CAC CTC AGC AGC GTT TTG AT-3′; β-actin, forward, 5′-ATC TGG CAC CAC ACC TTC TA-3′, reverse, 5′-CGT CAT ACT CCT GCT TGC TG-3′. Real-time PCRs were performed by the real-time fluorescence detection method using the LightCycler system with an iTaq SYBR Green Supermix and ROX kit (Bio-Rad, Hercules, CA). The primer sequences for real-time PCR were as follows: ICAM-1, forward, 5′-CTC CAA TGT GCC AGG CTT G -3′, reverse, 5′-CAG TGG GAA AGT GCC ATC CT-3′; and GAPDH, forward, 5′-GTC TTC ACC ACC ATG GAG AA-3′, reverse, 5′-AGG AGG CAT TGC TGA TGA TC-3′. The cycling conditions were as follows: initial denaturation at 95°C for 10 min, followed by 30 amplification cycles at 95°C for 15 s, 56°C for 5 s, and 72°C for 15 s. After amplification, the temperature was slowly elevated above the melting temperature of the PCR product to measure the fluorescence and thereby to determine the melting curve. A negative control without cDNA template was performed to assess the overall specificity. The cell extracts were prepared from HUVECs treated with stimuli, fractionated by electrophoresis on 6–15% SDS-PAGE gel, and transferred onto a nitrocellulose membrane. Nonspecific binding was blocked by soaking the membrane in TBST buffer (0.5 mol/l Tris-HCl [pH 7.5], 0.15 mol/l NaCl, and 1 g/l Tween 20) containing 3–5% nonfat milk. The membrane was incubated with anti–ICAM-1, anti-CCL15, anti–phospho-JAK2, anti–phospho-AKT, anti–phospho-PI3K, anti–phospho-STAT3, anti-JAK2, anti-AKT, anti-STAT3, anti–β-actin, and anti–proliferating cell nuclear Ag. Peroxidase activity on the membrane sheet was visualized on x-ray films by a standard ECL procedure. The cell surface expression of ICAM-1 was examined using cell-based ELISA. Flat-bottom 96-well plates were coated with 0.1% gelatin. HUVECs were cultured in 96-well plates (2 × 104 cells/well) for 24 h. The ECs were treated or not treated with CCL15, washed with PBS, and fixed with 3.7% formaldehyde in PBS for 15 min. After blocking with 3% BSA/PBS, cells were incubated with 0.2 mg/ml anti–ICAM-1 Ab in 1% BSA/PBS for 1 h at room temperature and then washed three times with PBS. After 1 h incubation with a 1:5000 dilution of peroxidase-labled goat anti-rabbit IgG in 1% BSA in PBS, wells were washed three times with 0.5% Tween 20 in PBS. The bound peroxidase was detected using the chemiluminescense ELISA reagent. The cell adhesion assay was performed as described in a previous study (26). HUVECs were grown to confluence in six-well plates and treated with CCL15 or CCL15 plus a signal inhibitor at various concentrations of CCL15 and for the incubation times as indicated. Monocytoid U937 cells, THP-1 monocytes, or PBMCs labeled with calcein-AM (Invitrogen, Eugene, OR) were added to each well in the same concentration and incubated for 30 min. The nonadherent cells were aspirated and the monolayer was gently washed with PBS three times. The fluorescence intensity was measured by using a Wallac Victor2 1420 multilabel counter (PerkinElmer, Monza, Italy). The number of adherent cells was expressed as fluorescence intensity. For monocyte adhesion to ECs under shear-stress conditions, confluent HUVECs grown in 100-mm tissue culture dishes (BD Falcon, Franklin Lakes, NJ) were exposed in the growth medium to an arterial level of either laminar shear stress (LS; 15 dynes/cm2) by rotating a Teflon cone unidirectionally, or to oscillatory shear stress (OS; ±5 dynes/cm2) for unstable shear conditions by rotating the cone back and forth using a stepping motor (27). HUVECs were exposed to shear conditions for 1 d and were either treated or not treated with CCL15 for 12 h, and monocyte adhesion was determined using fluorescence-labeled THP-1 cells and PBMCs. Analyses were repeated three times and the results reported are the means of three independent experiments. The data are presented as means ± SD, and statistical comparisons between groups were performed using one-way ANOVA followed by a Student t test. Unless otherwise stated, all experiments were performed with triplicate samples and repeated at least three times. We first examined whether H/R increases expression of CCL15 as well as ICAM-1 in ECs. Cultured HUVECs were exposed to hypoxia for 2 h and reoxygenated for various times up to 24 h. RT-PCR analysis showed that CCL15 mRNA levels increased in HUVECs after H/R and reached maximum levels 2 h after reoxygenation in a similar trend of ICAM-1 mRNA expression (Fig. 1A). Protein levels of CCL15 and ICAM-1 increased in HUVECs after H/R, reaching a 7-fold increase 12 h after reoxygenation (Fig. 1B, 1C). Expression of other CCR1 ligands such as CCL3 and CCL5 were also increased in the ECs after H/R in a similar way to that of CCL15 and ICAM-1 (Supplemental Fig. 1A). H/R increased expression of CCL15 and ICAM-1. (A–C) Cultured HUVECs were exposed to hypoxia for 2 h and reoxygenation for up to 24 h. The mRNA and protein levels were measured by RT-PCR (A), Western blot analysis (B), and cell-based ELISA (C). (D–G) HUVECs were transfected with siRNA in 100 nM concentration as indicated and were exposed to hypoxia for 2 h and reoxygenation for 30 min or 12 h. RT-PCR was performed using the ICAM-1 primers (D, F). Western blot analysis was performed in HUVECs using Ab against human ICAM-1 (E, G). Bands in gels and blots were quantified by densitometry. *p < 0.01 compared with control. **p < 0.01 compared with reoxygenation for 30 min alone (D, F) or 12 h alone (E, G). The data are expressed as the means ± SD of three or six independent experiments. Because ECs secretes CCR1 chemokines including CCL15, it is probable that autocrine regulation of ICAM-1 expression by CCL15 may occur during H/R. To confirm this, we investigated the expression of ICAM-1 as well as CCL15 in ECs after H/R in the presence or absence of siRNAs for CCR1 and for CCL15. Knockdown of CCL15 or CCR1 in ECs was confirmed in transfected ECs (Supplemental Fig. 1B, 1C). Although expressions of ICAM-1 and CCL15 increased by ∼5- to 6-fold after H/R, there was a 50–80% decrease in the mRNA, and the protein expression of ICAM-1 was observed in ECs transfected with siR-CCL15 or siR-CCR1 (Fig. 1D–G). This finding suggests that CCL15 secreted by ECs do indeed provide an immediate autocrine feedback loop to stimulate ICAM-1 by CCL15 upon H/R. To examine whether proinflammatory cytokines increase expression of CCL15 in ECs, cultured HUVECs were treated with IL-1β, TNF-α, or LPS for 6 h or with IFN-γ for 12 h. Western blot data showed that stimulation with the cytokines and LPS upregulated CCL15 protein expression (Fig. 2A). Stimulation of ICAM-1 expression by TNF-α and IL-1β was not inhibited by siR-CCR1 or by siR-CCR3, whereas IFN-γ was slightly inhibited by siR-CCR1, indicating that CCR1 may indirectly affect signaling pathways leading to activation of ICAM-1 gene expression by IFN-γ but not TNF-α and IL-1β (Supplemental Fig. 2A, 2B). We barely observed the inhibitory effect of siR-CCR1 on adhesion to IFN-induced HUVECs (Supplemental Fig. 2C), and inhibition by siR-CCR3 was negligible (Supplemental Fig. 2D). Proinflammatory cytokines induce expression of CCL15 and upregulate expression of ICAM-1 in HUVECs. (A) HUVECs were treated with IL-1β (5 ng/ml), TNF-α (5 ng/ml), or LPS (1 μg/ml) for 6 h or IFN-γ (50 ng/ml) for 12 h. CCL15 protein levels were determined by Western blots (left panel). Bands in the blot were quantified by densitometry (right panel). (B and C) HUVECs were incubated for 12 h in the presence of CCL15 and/or IFN-γ. ICAM-1 mRNA and protein levels were determined by RT-PCR and Western blots, which were quantified by densitometry. (D) The total RNA was isolated and real-time quantitative RT-PCR was performed using the ICAM-1 primers. GAPDH was used as an internal control. (E) Cell-based ELISA was performed and showed that CCL15 upregulated ICAM-1 protein expression in HUVECs. *p < 0.01 compared with medium alone. The data are expressed as the means ± SD of at least three independent experiments. To examine the effect of exposure of ECs to CCL15, cultured HUVECs were stimulated with CCL15 (50 ng/ml) for time periods of 1–24 h. ICAM-1 expression increased within 2 h of incubation with CCL15 and reached maximal expression after 12 h (data not shown). When ECs were incubated with various concentration of CCL15 in the range of 0–50 ng/ml, CCL15 enhanced ICAM-1 mRNA and protein levels in ECs in a dose-dependent manner (Fig. 2B, 2C). IFN-γ was used as a positive control. 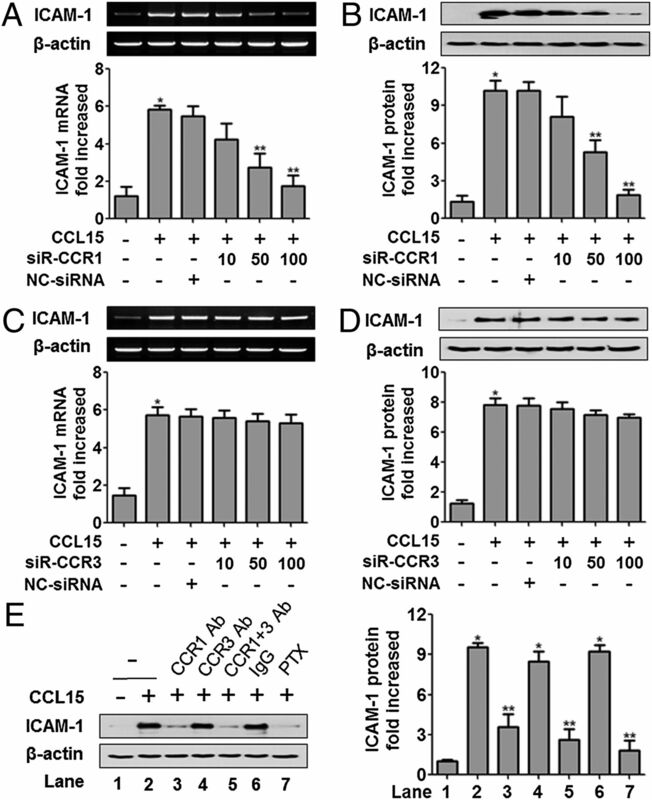 The expression of ICAM-1 on coincubation with CCL15 and IFN-γ did not appear to be synergistic, although expression levels of ICAM-1 mRNA and protein were slightly increased in the cotreated cells. Real-time PCR and cell-based ELISA showed that mRNA and protein levels of ICAM-1 were increased ∼4- and 5-fold, respectively, by treatment with 50 ng/ml CCL15 (Fig. 2D, 2E). To determine whether CCL15 stimulates ICAM-1 expression in ECs through CCR1 and/or CCR3, HUVECs were transfected with siRNA specific for CCR1 or CCR3 and then exposed to CCL15. Knockdown of CCR1 and CCR3 was confirmed by analysis of receptor mRNAs (Supplemental Fig. 1D, 1E). HUVECs with knockdown of CCR1 expressed markedly low levels of ICAM-1 mRNA and protein, that is, ∼79 and 80% reductions, respectively, compared with those treated with nonspecific siRNA (Fig. 3A, 3B). Suppression of ICAM-1 protein expression was confirmed by confocal microscopic imaging of HUVECs transfected with CCR1 siRNA (data not shown). In contrast, knockdown of CCR3 in HUVECs resulted in only a slight reduction in CCL15-induced ICAM-1 mRNA and protein expression, that is, ∼10 and 15% reduction, respectively (Fig. 3C, 3D). CCL15 induces ICAM-1 exprssion predominantly through CCR1 in HUVECs. HUVECs were transfected with siR-CCR1 or siR-CCR3 at various nanomolar concentrations. NC-siRNA was used as control in 100 nM. (A–D) Transfected HUVECs were stimulated with CCL15 (50 ng/ml) for 12 h as indicated. ICAM-1 mRNA and protein levels were determined by RT-PCR (A, C, upper panels) and Western blot analysis (B, D, upper panels). The data in gels and blots were quantified by densitometry (A–D, lower panels). (E) HUVECs pretreated with neutralizing Abs against CCR1 (10 ng/ml), CCR3 (10 ng/ml), or both for 1 h at 4°C were incubated in the presence of CCL15 (50 ng/ml) for 12 h. The ICAM-1 expression was measured by Western blots (left panel). IgG (10 ng/ml) and GPCR specific inhibitor, PTX (10 μM), were used as controls. Western blot data were quantified by densitometry (right panel). *p < 0.01 compared with medium alone, Significance, **p < 0.01 compared with CCL15 alone. The data are expressed as the means ± SD of three independent experiments. 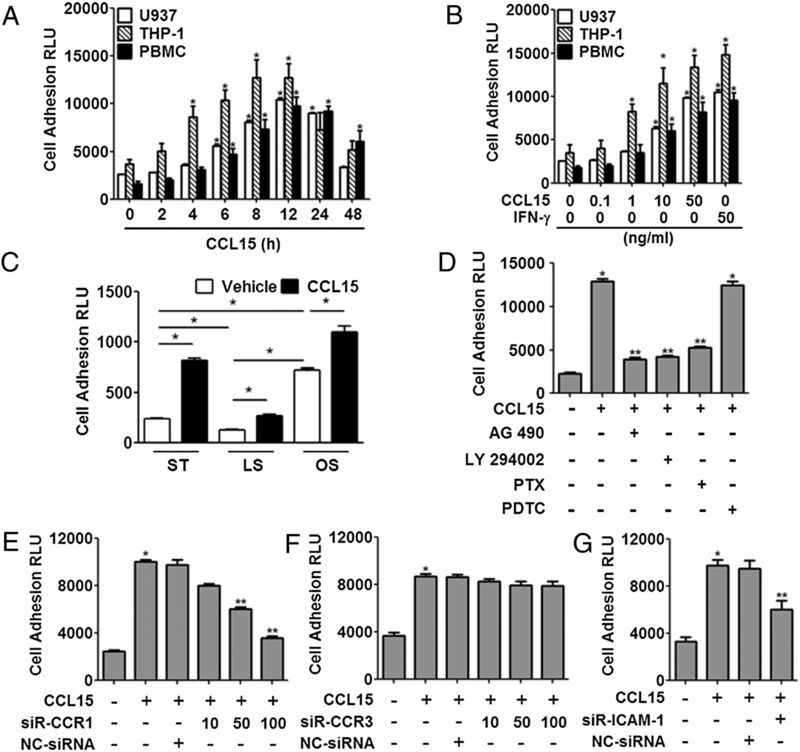 CCR1 binds not only to CCL15, but also to multiple inflammatory CC chemokines such as CCL3 and CCL5. Thus, we investigated the effects of the chemokines on expression of ICAM-1 in ECs. Our data showed that CCL3 and CCL5 significantly enhanced mRNA and protein levels of ICAM-1 in HUVECs in a similar fashion as CCL15 (Supplemental Fig. 3A, 3B). Meanwhile, CCL24, a CCR3 ligand, only slightly increased expression of ICAM-1 (Supplemental Fig. 3C, 3D). Our results indicate that CCL15 upregulates expression of ICAM-1 predominantly via CCR1, although CCR3 appears to play a minor role in induction of ICAM-1 by CCL15 and other chemokines. We also tested the roles of CCR1 and CCR3 using Abs against the receptors. HUVECs were pretreated with neutralizing Abs to CCR1 and/or CCR3, together with an isotype control IgG. The Western blot and the densitometry data indicate that neutralizing Abs to CCR1 and CCR3 reduced ICAM-1 expression by ∼71 and 11%, respectively (Fig. 3E). Addition of Abs against both CCR1 and CCR3 resulted in an 80% reduction of ICAM-1 protein level. Pertussis toxin (PTX), an inhibitor of GPCRs, blocked expression of ICAM-1 in ECs mediated by chemokine receptors that belong to the GPCR family. PTX resulted in an 85% reduction of ICAM-1 protein level. Taken together, our data indicate that CCL15 enhances ICAM-1 expression predominantly via CCR1 and that CCR3 may also be functional in ECs, although very weakly. To evaluate the roles of various signaling cascades in CCL15-induced ICAM-1 expression, we analyzed the expression of ICAM-1 protein in the presence of specific signaling inhibitors such as JAK2 inhibitor (AG490), PI3K inhibitor (LY294002), GPCR inhibitor (PTX), and NF-κB inhibitor (PDTC). We found that PTX, AG490, and LY294002 inhibited CCL15-induced expression of ICAM-1 by ∼80, ∼80, and 73%, respectively, whereas the NF-κB inhibitor reduced the ICAM-1 expression by ∼11% (Fig. 4A). Suppression of ICAM-1 protein expression by the signal inhibitors was confirmed by confocal microscopic imaging of HUVECs (data not shown), suggesting that JAK2 and its downstream pathways are involved in CCL15-induced ICAM-1 expression, whereas NF-κB may not play an important role. CCL15 activates JAK2/STAT3 and PI3K/AKT signaling pathways in ECs. (A) HUVECs were pretreated for 1 h with various signal inhibitors, that is, AG490, LY294002, PTX, and PDTC, and then stimulated with CCL15 (50 ng/ml) for 12 h or with control media. All inhibitors were used at 10 μM concentration. ICAM-1 protein levels were detected by Western blotting. (B) HUVECs were stimulated with CCL15 (50 ng/ml) at the indicated times. Whole-cell extracts were prepared and phosphorylation of protein kinases was detected by Western blot using phospho-specific Abs. (C) HUVECs were treated with various concentration of CCL15 for 30 min. CCL15 induced a marked increase in JAK2, PI3K, AKT, and STAT3 phosphorylation in a dose-dependent manner. Western blot data were quantified by densitometry. We next examined phosphorylation of JAK2 in ECs after stimulation with CCL15. The increase in phosphorylation of JAK2 was rapid and decreased after 1 h. Because STAT3 is known to be phosphorylated by JAK2 in response to IFN-γ and translocated into the nucleus, where it activates transcription of ICAM-1, we analyzed phosphorylation of STAT3 in response to CCL15. We observed an increase in STAT3 phosphorylation that peaked between 5 and 10 min and decreased after 30 min (Fig. 4B). Phosphorylation of both JAK2 and STAT3 increased in a dose-dependent manner (Fig. 4C). Because JAK2 has been known to be upstream of the PI3K/AKT pathway, we examined the effects of CCL15 on activation of the downstream signaling pathways and showed that CCL15 also activated phosphorylation of PI3K and AKT (Fig. 4B, 4C). We next investigated whether CCL15 regulates transcription of the ICAM-1 gene via the GAS element using reporter gene constructs. HUVECs were transiently transfected with pGAS/Luc, pICAM-1/Luc, or pICAM-1 (mGAS)/Luc plasmid. CCL15 activated transcription of both the GAS minimal promoter and the ICAM-1 promoter in a dose-dependent manner, starting from a concentration of 1 ng/ml and achieving an ∼7.5-fold increase in the GAS reporter gene expression at 50 ng/ml (Fig. 5A, 5B). Alternatively, it did not activate transcription of the NF-κB minimal promoter (Fig. 5C), indicating that CCL15 activates transcription of the ICAM-1 gene via GAS elements. We introduced mutations in the GAS sequence of the ICAM-1 promoter in the ICAM-1(-1357)/Luc and analyzed the effect of the GAS mutation on transcription in HUVECs. Our results showed that mutations in the GAS sequence in the ICAM-1 promoter abolished induction of ICAM-1 promoter activity by CCL15 (Fig. 5A). 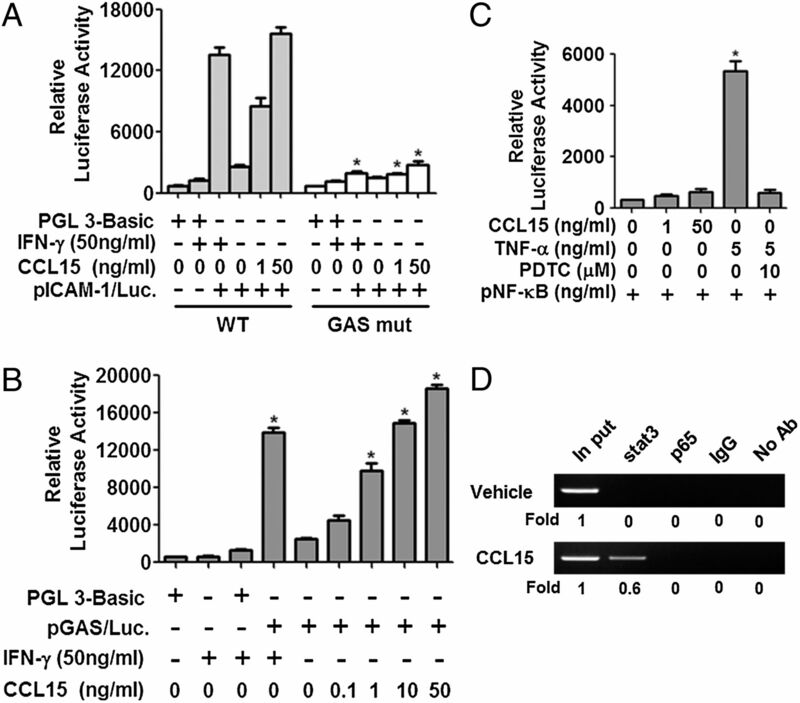 CCL15 activates transcription of ICAM-1 and GAS minimal promoters, and STAT3 binds to the GAS sequence of ICAM-1 promoter in vivo. (A–C) HUVECs were transiently transfected with various reporter plasmids as indicated: ICAM-1 promoter/Luc fusion plasmid and ICAM-1 (mGAS)/Luc, GAS minimal promoter/Luc, and NF-κB minimal promoter/Luc plasmid. Transfected HUVECs were stimulated with various concentrations of CCL15 for 12 h. IFN-γ or TNF-α was treated at the concentrations as indicated for 12 h. Cells were harvested and cell extracts were analyzed for luciferase activities using a luminometer. Values are the average of four separate experiments in quadruplicates samples. *p < 0.01 compared with control. The data were expressed as the means ± SD of four individual experiments. (D) ChIP assays were performed in HUVECs treated with CCL15 for 12 h and in control cells without any treatment (Vehicle) as indicated on the left of the gel. Abs used for precipitation are shown on the top. Input represents PCR amplification of the unprecipitated DNA. To examine the effects of CCL15 on the binding of STAT3 to the GAS sequence in the ICAM-1 promoter in the chromatin context, we performed a ChIP assay. Treatment of ECs with CCL15 resulted in binding of STAT3, but binding of NF-κB was not detected (Fig. 5D), which is consistent with the results of reporter assays. These results suggest that CCL15 induces ICAM-1 expression at the transcriptional level via the GAS sequence, and they further indicate that STAT3 plays an important role in CCL15-induced transcription of ICAM-1. The observed activation of ICAM-1 expression by CCL15 suggests that CCL15 might induce monocyte adhesion to ECs. To evaluate the effect of CCL15 on monocyte adhesion to ECs, HUVECs were treated with CCL15 (50 ng/ml), and an in vitro monocyte adhesion assay was performed at various time points (0–48 h). Adhesion of various monocytic cells such as U937, THP-1, and PBMCs were markedly increased when HUVECs were treated with CCL15 compared with the levels in unstimulated HUVECs. The maximum monocyte adhesion activity was attained at 12 h CCL15 stimulation. CCL15-induced monocyte adhesion to HUVECs remained significantly higher for 24 h but returned to basal levels at 48 h (Fig. 6A). Exposure of the ECs to CCL15 (0–50 ng/ml) significantly increased adhesion of the monocytic cells to HUVECs in a dose-dependent manner, and the fluorescence intensity of the adherent cells also increased (Fig. 6B). Our data suggest that upregulation of ICAM-1 expression contributes to increased adhesiveness of monocytes to the ECs. CCL15 stimulates monocyte adhesion to ECs, and CCL15 increased monocyte adhesion to ECs under shear-stress conditions. (A and B) HUVECs were stimulated with CCL15 (50 ng/ml) at the indicated times or with various concentrations of CCL15 for 12 h, and were cocultured with FITC-labeled U937, THP-1, or PBMCs. Adhesion of monocytic cells to HUVECs was quantitatively measured by fluorescence intensities of FITC-labeled monocytic cells adherent to CCL15-induced HUVECs. (C) HUVECs were subjected to OS (±5 dynes/cm2), LS (15 dynes/cm2), or remained static in the incubator. HUVECs were exposed to shear conditions for 1 d with CCL15 for 12 h, and monocyte adhesion was determined using fluorescence-labeled THP-1. Adhesion of THP-1 cells to HUVECs was quantitatively measured by fluorescence intensities of fluorescence-labeled THP-1 adherent to HUVECs. *p < 0.01 compared with control. The data are expressed as the means ± SD of individual experiments (n = 8). (D) HUVECs were pretreated for 1 h with various signal inhibitors (10 μM each) such as AG490, LY294002, PTX, and PDTC, stimulated with CCL15 (50 ng/ml) for 12 h, and cocultured with FITC-labeled U937 monocytic cells. (E–G) HUVECs were transfected with siR-CCR1 or siR-CCR3 at various nanomolar concentrations. siR-ICAM-1 and NC-siRNA were used in 100 nM concentrations. The transfected cells were then stimulated with CCL15 (50 ng/ml) for 12 h and cocultured with FITC-labeled U937 monocytic cells. Adhesion of U937 cells to HUVECs was quantitatively measured by fluorescence intensities of FITC-labeled U937 cells adherent to HUVECs. *p < 0.01 compared with control, **p < 0.01 compared with CCL15 alone. The data are expressed as the means ± SD of three independent experiments. RLU, Relative light units. To determine whether CCL15 affects endothelial inflammation under in vivo mimicking conditions, we measured monocyte binding to HUVECs under both LS and OS conditions as described previously (27). Consistent with previous results, treatment of HUVECs with CCL15 (50 ng/ml; 12 h) significantly increased monocyte adhesion in static conditions (3.2-fold). LS suppressed monocyte binding compared with static conditions. Monocyte binding to OS-stimulated HUVECs was greater than to LS-stimulated HUVECs. The effect of CCL15 on monocyte binding to the endothelium was also investigated under 24 h of LS or OS conditions in HUVECs. CCL15 treatment (50 ng/ml; 12 h) significantly stimulated THP-1 monocyte binding in LS (2.5-fold) as well as in OS (1.6-folds) conditions (Fig. 6C, Supplemental Fig. 4A). These results demonstrate that CCL15 plays a role in endothelial inflammation in static in vitro conditions as well as in vivo mimicking culture conditions. To test whether JAK2 and PI3K/AKT play roles in CCL15-induced U937 cell adhesion to ECs, HUVECs were treated for 1 h with signal pathway inhibitors before stimulation with CCL15 (50 ng/ml). Following 12 h stimulation with CCL15, the adhesion index was increased ∼4-fold relative to unstimulated cells. We found that AG490, LY294002, and PTX significantly inhibited monocytoid U937 adhesion on CCL15-induced HUVECs, whereas PDTC had no effect (Fig. 6D, Supplemental Fig. 4B). The decrease in the adhesion of the monocytic cells to ECs was 70% for JAK2 inhibitor, 68% for PI3K inhibitor, 60% for PTX inhibitor, and 3% for PDTC inhibitor. Inhibition of PI3K also reduced adhesion of the monocytic cells to stimulated ECs, indicating that the PI3K/AKT pathway may be involved in activation of ICAM-1 expression via stimulation of STAT3 or other transcription factors. To evaluate the role of CCR1 and CCR3 in monocyte adhesion to ECs, HUVECs were transfected with various concentrations of siR-CCR1 or siR-CCR3 (10, 50, 100 nM) and exposed to CCL15 for 12 h. siR-CCR1 inhibited monocytoid U937 adhesion to CCL15-induced HUVECs in a dose-dependent manner, whereas the control-transfected group did not show inhibition of adhesion. The degree of inhibition was 2.5-fold at a dose of 100 nM siRNA (Fig. 6E, Supplemental Fig. 4C). In contrast, siR-CCR3 did not significantly inhibit the monocytoid cell adhesion to CCL15-induced HUVECs (Fig. 6F). We also tested HUVECs that were transfected with siR-ICAM-1 (100 nM) and exposed to CCL15 for to 12 h. ICAM-1-siRNA inhibited monocytoid U937 adhesion to CCL15-induced HUVECs (Fig. 6G). Our data suggest that knockdown of CCR1 inhibits CCL15-induced adhesion of monocytes to HUVECs. Because H/R increased expression of CCR1 chemokines as well as ICAM-1, we examined whether H/R increases monocytes adhesion to HUVECs. Cultured HUVECs were exposed to hypoxia for 2 h and reoxygenated for various lengths of time. Adhesion of U937, THP-1 monocytes, and PBMCs was markedly increased when HUVECs were stimulated with H/R compared with unstimulated HUVECs. The adhesion activities of various monocytic cells to ECs increased by 2.9-fold after exposure to H/R, which correlated with the protein levels of ICAM-1 expressed after H/R (Fig. 7A). Our data suggest that enhanced expression of CCL15 and ICAM-1 after H/R contributes to increased adhesiveness of monocytes to ECs. H/R stimulates various monocyte adhesion to ECs. (A) Cultured HUVECs were exposed to hypoxia for 2 h and reoxygenation for up to 24 h. Monocyte adhesion activities were measured by fluorescence intensities of FITC-labeled monocytic cells adherent to HUVECs. (B–D) HUVECs were transfected with siR-CCL15 (B), siR-CCR1 (C), or siR-CCR3 (D). Transfected HUVECs were stimulated with hypoxia for 2 h and reoxygenation for 12 h. Monocyte adhesion activities were measured by fluorescence intensities of FITC-labeled monocytic cells (U937, THP-1, and PBMCs) adherent to HUVECs. *p < 0.01 compared with control, **p < 0.01 compared with reoxygenation 12 h alone. The data are expressed as the means ± SD of four independent experiments. RLU, Relative light units. HUVECs were transfected with various concentrations of siRNAs and exposed to hypoxia for 2 h and reoxygenation for 12 h. The siRNAs against CCL15 and CCR1 inhibited monocyte adhesion to H/R-induced HUVECs in a dose-dependent manner (Fig 7B, 7C), whereas siR-CCR3 barely reduced monocyte adhesion to ECs (Fig. 7D). The inhibition by siR-CCR1 and siR-CCL15 was 41 and 29%, respectively, at 100 nM concentration. Our data suggest that CCR1 plays a critical role H/R-induced monocyte adhesion to ECs. Previous studies reported that H/R increased the expression of ICAM-1 in ECs and increased leukocyte adhesion in endothelial injury (1–4). In this study, we showed that exposure of vascular ECs to hypoxia resulted in the enhanced expression of CCL15 and other ligands for CCR1 and increased levels of mRNA and protein for CCL15. We also demonstrated that CCL15 stimulated expression of ICAM-1 in an autocrine fashion in ECs after H/R. Furthermore, we showed that CCL15 stimulated ICAM-1 expression and adhesion of monocytes to ECs via signaling pathways involving JAK2, PI3K/AKT, and STAT3 proteins, and that increased adhesion of monocytes to ECs after exposure to H/R was reduced by siRNA for CCR1. Hypoxia occurs in cardiovascular, hematological, and pulmonary disorders, arthritic joints, atherosclerosis plaques, and ischemic wounds (28–31). Previous reports showed that H/R induced the generation of a burst of reactive oxygen species, which could activate NF-κB (1, 4). Recently, it was reported that STAT3 was activated in ECs following H/R (32). The increase in ICAM-1 and CCL15 expression after H/R may be related to activation of NF-κB and/or STATs. Activated NF-κB is known to stimulate expression of CCL15 in human U937 monocytoid cells (33). We found that H/R induced rapid CCL15 expression in ECs, and ICAM-1 expression was enhanced after H/R. Moreover, knockdown of CCL15 or CCR1 by siRNAs resulted in inhibition of ICAM-1 in ECs after H/R, indicating that CCL15 produced by ECs after H/R acts to enhance expression of ICAM-1 in an autocrine manner. Our present data demonstrate that CCL15 directly activates expression of ICAM-1 in ECs in a time- and concentration-dependent manner, starting at 6 h and attaining a maximum response between 8 and 24 h. The level of ICAM-1 mRNA continued to increase over time up to 24 h, and the levels at 24 h varied between 4- and 5-fold greater than basal levels. 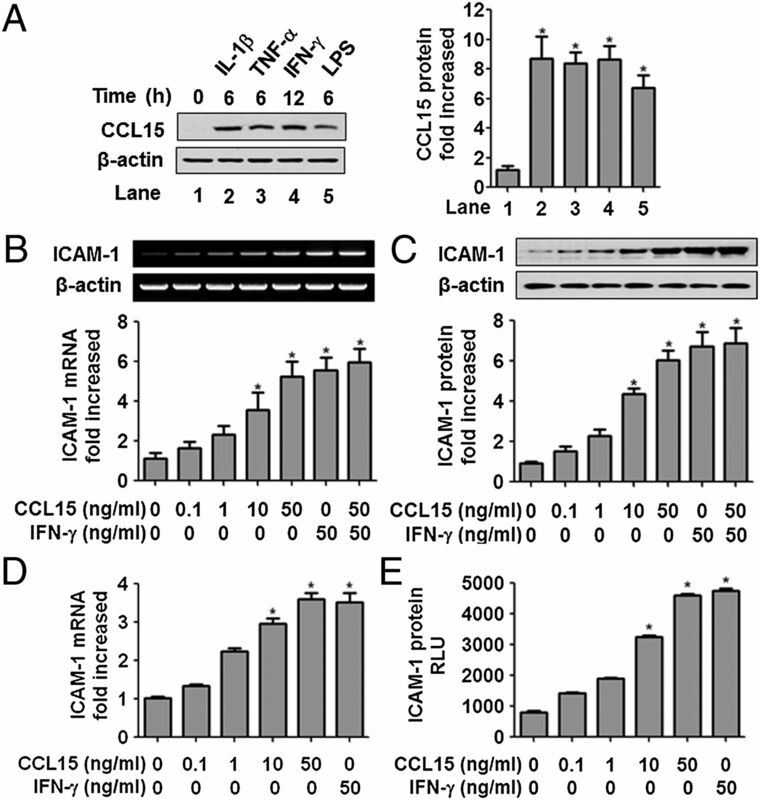 This correlated with the increase in ICAM-1 promoter activity induced by CCL15, indicating that CCL15 upregulates ICAM-1 at the transcriptional level. CCL15 is an agonist for CCR1 and CCR3 and is known to be a potent chemoattractant for neutrophils, monocytes, and lymphocytes (22). Blockade of CCR1 by specific mAb or knockdown of CCR1 expression strongly attenuated expression of ICAM-1 and adhesion of U937 monocytoid cells to ECs in response to CCL15. In contrast, blockade of CCR3 in HUVECs only weakly decreased ICAM-1 expression and adhesion of U937 cells to ECs, indicating that CCL15 exerts its effects in ECs predominantly through CCR1. CCR1 binds not only to CCL15, but also to multiple other inflammatory CC chemokines such as CCL5 and CCL3, which are known to be elevated in arterial plaques and to play roles in vascular diseases by recruiting inflammatory immune cells to the endothelium (34, 35). Our data showed that CCL5 and CCL3 were able to activate ICAM-1 expression in ECs, indicating that ICAM-1 expression is regulated through the shared receptor CCR1. A previous study showed that CCR1 plays important roles in the induced arrest of monocytes, activated T cells, or Th1 cells to ECs (36). Although CCR1 has been implicated in inflammation and atherosclerosis, it has been reported that deletion of CCR1 increased atherosclerotic lesion development and T cell infiltration (37), and that deficiency in Ccr1 caused an increase in proinflammatory IFN-γ in the neointima of Ccr1−/−apoe−/− mice (38). Studies by others and our present results suggest that CCL15 and its receptors, especially CCR1, may not only play a role in the recruitment of monocytes to ECs, but also contribute to converting ECs to an activated EC phenotype expressing ICAM-1, suggesting involvement of CCL15 and its receptors in atherosclerosis. JAK/STAT signaling can be activated by cytokines, growth factors, and reactive oxygen species via cytokine and growth factor receptors or other cell surface GPCRs (12, 13). Because CCR1 has been identified as a GPCR, we hypothesized that CCL15 might mediate activation of the JAK/STAT signal cascade. Our data showed that CCL15 rapidly activated phosphorylation of JAK2, AKT, PI3K, and STAT3 probably via basal levels of its receptors. We demonstrated that JAK2 inhibitor, PI3K/AKT inhibitor, and GPCR inhibitor significantly inhibited CCL15-induced ICAM-1 expression, whereas NF-κB inhibitor had no significant effects. Further analysis of the signaling pathway showed that CCL15 directly induces phosphorylation of JAK2, STAT3, PI3K, and AKT, a downstream target of PI3K, in ECs, suggesting crosstalk between the JAK2 and PI3K/AKT pathways. It was previously reported that JAK2 and JAK3 were phosphorylated very rapidly in T cells by CCL5 (39). CCL3 is also known to activate JAK2 via CCR5 receptor, which occurred at 1 min after stimulation of Chinese hamster ovary cells expressing CCR5 (40). Of the various STAT isoforms activated during H/R, only STAT3 can bind the GAS element in the ICAM-1 promoter (14, 15). ChIP assay showed that STAT3 bound to DNA fragments from the CCL15-treated group. This result suggests that STAT3 has an important role in inducing ICAM-1 expression by CCL15. Western blot analysis showed that CCL15 stimulated phosphorylation of STAT3. Furthermore, the intracellular loops of CCR1 contain a putative STAT3 recognition sequence, YRLQ (residues 311–314) (41). Our data suggest that CCL15-induced ICAM-1 expression may be mediated, in part, via ligand activation of intracellular domains of the CCR associated with JAK2/STAT3 in ECs. Phosphorylation of STAT3, at Y705 and S727, appear to be induced by distinct signaling cascades (42). It has been reported that the p85 regulatory subunit of PI3K could bind to phosphorylated STAT3 (pTyr656 and pTyr705) in response to IFN-γ stimulation, and that the activated PI3K subsequently can promote the serine phosphorylation of STAT3, which is critical for the formation of stable STAT3 homodimers or STAT3-STAT1 heterodimers. Phophorylation of a Y657 KIM motif of STAT3 appears to act as a docking site for the lipid/serine kinase PI3K (24). This upregulation of ICAM-1 had functional effects, namely, the 4-fold increase in adhesion of U937 monocytoid cells. We found that CCL15-induced U937 cell adhesion to HUVECs was significantly decreased by inhibitors of JAK2, PI3K/AKT, and GPCR, which correlated with decreased expression of ICAM-1. 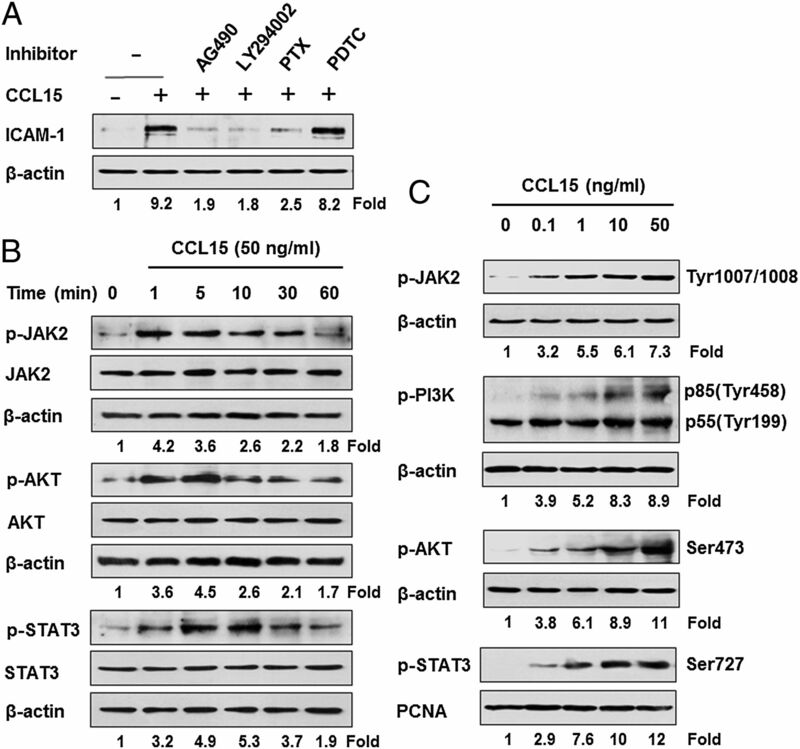 These results provide further evidence for involvement of the JAK/STAT signaling pathway in CCL15-induced U937 cell adhesion. Additionally, we demonstrated that siR-CCR1 suppressed ICAM-1 expression as well as monocyte adhesion to ECs. In summary, we provide evidence that hypoxia stimulates expression of CCL15 in ECs and that CCL15 induces expression of lCAM-1 via activation of the JAK2/STAT3 pathway and increases monocyte adhesion to ECs. To the best of our knowledge, the present work is the first demonstration that hypoxia leads to an increase of CCL15 expression in human ECs. STAT3 activation has been demonstrated to play a role in autoimmune disease and chronic inflammatory diseases. Therefore, our findings suggest that CCR1 and JAK/STAT signaling intermediates may be important interventional targets for cardiovascular diseases as well as for other chronic inflammatory diseases characterized by leukocyte recruitment and involving upregulation of cell adhesion molecules. This work was supported by National Research Foundation of Korea grants (20100024375 and 20110026281) funded by the Ministry of Education, Science, and Technology of the Government of Korea.
. 1994. Measurement and characterization of free radical generation in reoxygenated human endothelial cells. Am. J. Physiol. 266: C700–C708.
. 1992. Hypoxia-mediated induction of endothelial cell interleukin-1α. An autocrine mechanism promoting expression of leukocyte adhesion molecules on the vessel surface. J. Clin. Invest. 90: 2333–2339.
. 1997. Nitric oxide attenuates reoxygenation-induced ICAM-1 expression in coronary microvascular endothelium: role of NFκB. J. Mol. Cell. Cardiol. 29: 2599–2609.
. 2002. Oxygen radicals trigger activation of NF-κB and AP-1 and upregulation of ICAM-1 in reperfused canine heart. Am. J. Physiol. Heart Circ. Physiol. 282: H1778–H1786.
. 2007. Endothelial-dependent mechanisms of leukocyte recruitment to the vascular wall. Circ. Res. 101: 234–247.
. 2011. Emerging mechanisms of neutrophil recruitment across endothelium. Trends Immunol. 32: 461–469.
. 1999. Regulation of intercellular adhesion molecule-1 (CD54) gene expression. J. Leukoc. Biol. 66: 876–888. 1999. Cytokine regulation of cellular adhesion molecule expression in inflammation. Cytokine Growth Factor Rev. 10: 27–39.
. 1994. Synergistic activation of intercellular adhesion molecule 1 (ICAM-1) by TNF-α and IFN-γ is mediated by p65/p50 and p65/c-Rel and interferon-responsive factor Stat1α (p91) that can be activated by both IFN-γ and IFN-α. FEBS Lett. 354: 220–226.
. 2006. Migration inhibitory factor up-regulates vascular cell adhesion molecule-1 and intercellular adhesion molecule-1 via Src, PI3 kinase, and NFκB. Blood 107: 2252–2261.
. 2009. Protein kinase C-δ and phosphatidylinositol 3-kinase/Akt activate mammalian target of rapamycin to modulate NF-κB activation and intercellular adhesion molecule-1 (ICAM-1) expression in endothelial cells. J. Biol. Chem. 284: 4052–4061.
. 1994. Stimulation of the human intercellular adhesion molecule-1 promoter by interleukin-6 and interferon-γ involves binding of distinct factors to a palindromic response element. J. Biol. Chem. 269: 21146–21154.
. 1998. Activation of the JAK-STAT pathway by reactive oxygen species. Am. J. Physiol. 275: C1640–C1652.
. 1994. The signalling pathways of interleukin-6 and γ interferon converge by the activation of different transcription factors which bind to common responsive DNA elements. Mol. Cell. Biol. 14: 1657–1668.
. 1997. Targeted inhibition of interferon-gamma-dependent intercellular adhesion molecule-1 (ICAM-1) expression using dominant-negative Stat1. J. Biol. Chem. 272: 28582–28589.
. 2008. Chemokines in atherosclerosis: an update. Arterioscler. Thromb. Vasc. Biol. 28: 1897–1908.
. 2002. A novel chemokine, leukotactin-1, induces chemotaxis, pro-atherogenic cytokines, and tissue factor expression in atherosclerosis. Atherosclerosis 161: 255–260.
. 2004. Involvement of leukotactin-1, a novel CC chemokine, in human atherosclerosis. Atherosclerosis 174: 35–42.
. 2006. Carotid atherosclerosis is associated with enhanced β-chemokine levels in patients on continuous ambulatory peritoneal dialysis. Atherosclerosis 186: 146–151.
. 1999. Differential effects of leukotactin-1 and macrophage inflammatory protein-1α on neutrophils mediated by CCR1. J. Immunol. 162: 4938–4942.
. 2004. Angiogenic activity of human CC chemokine CCL15 in vitro and in vivo. FEBS Lett. 570: 47–51.
. 1997. Molecular cloning of leukotactin-1: a novel human β-chemokine, a chemoattractant for neutrophils, monocytes, and lymphocytes, and a potent agonist at CC chemokine receptors 1 and 3. J. Immunol. 159: 5201–5205.
. 2012. JAK and STAT signaling molecules in immunoregulation and immune-mediated disease. Immunity 36: 542–550.
. 1997. STAT3 as an adapter to couple phosphatidylinositol 3-kinase to the IFNAR1 chain of the type I interferon receptor. Science 276: 1418–1420.
. 2012. Human lactoferrin suppresses TNF-α-induced intercellular adhesion molecule-1 expression via competition with NF-κB in endothelial cells. FEBS Lett. 586: 229–234.
. 2011. Sphingosylphosphorylcholine stimulates CCL2 production from human umbilical vein endothelial cells. J. Immunol. 186: 4347–4353.
. 2003. Bone morphogenic protein 4 produced in endothelial cells by oscillatory shear stress stimulates an inflammatory response. J. Biol. Chem. 278: 31128–31135.
. 1999. Evidence of hypoxic areas within the arterial wall in vivo. Arterioscler. Thromb. Vasc. Biol. 19: 870–876.
. 2001. Microenvironmental influence on macrophage regulation of angiogenesis in wounds and malignant tumors. J. Leukoc. Biol. 70: 478–490. 2001. Hypoxia-inducible factor 1: oxygen homeostasis and disease pathophysiology. Trends Mol. Med. 7: 345–350.
. 2004. Physiologic responses to hypoxia and implications for hypoxia-inducible factors in the pathogenesis of rheumatoid arthritis. Arthritis Rheum. 50: 10–23.
. 2012. 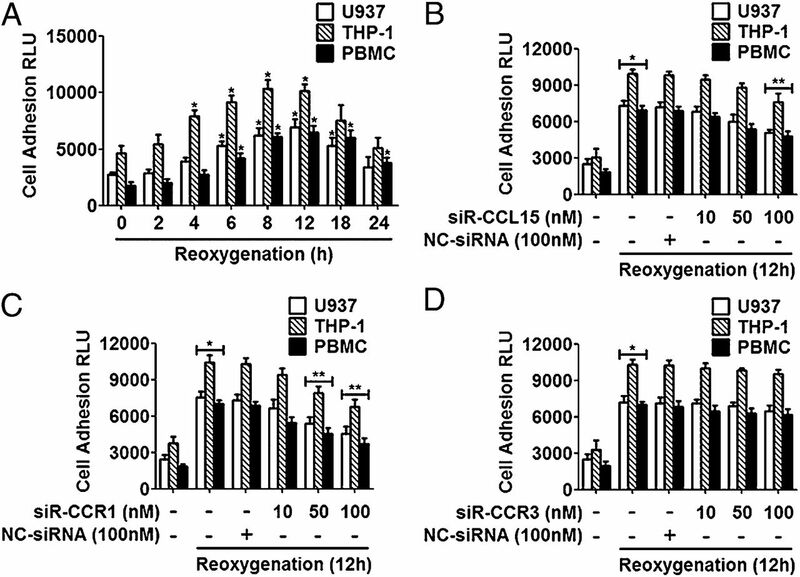 Activation of Stat3 in endothelial cells following hypoxia-reoxygenation is mediated by Rac1 and protein kinase C. Biochim. Biophys. Acta 1823: 997–1006.
. 2004. Involvement of two NF-κB binding sites in PMA-induced expression of the human leukotactin-1/CCL15 gene in U937 monocytoid cells. Mol. Cells 17: 316–321. 2002. Inflammation in atherosclerosis. Nature 420: 868–874.
. 2007. Y-box binding protein-1 controls CC chemokine ligand-5 (CCL5) expression in smooth muscle cells and contributes to neointima formation in atherosclerosis-prone mice. Circulation 116: 1812–1820.
. 2001. Specialized roles of the chemokine receptors CCR1 and CCR5 in the recruitment of monocytes and TH1-like/CD45RO+ T cells. Blood 97: 1144–1146.
. 2007. Ccr5 but not Ccr1 deficiency reduces development of diet-induced atherosclerosis in mice. Arterioscler. Thromb. Vasc. Biol. 27: 373–379.
. 2006. Deficiency in CCR5 but not CCR1 protects against neointima formation in atherosclerosis-prone mice: involvement of IL-10. Blood 107: 4240–4243.
. 2001. Rantes activates Jak2 and Jak3 to regulate engagement of multiple signaling pathways in T cells. J. Biol. Chem. 276: 11427–11431.
. 2004. CCL3, acting via the chemokine receptor CCR5, leads to independent activation of Janus kinase 2 (JAK2) and Gi proteins. FEBS Lett. 570: 126–132.
. 1995. Choice of STATs and other substrates specified by modular tyrosine-based motifs in cytokine receptors. Science 267: 1349–1353.